Draft: 2013, Oakland Athletics, CBBth rd. Chadwick Hudson Pinder was originally signed by A's scout Neil Avent…graduated from Poquoson (VA) High School…attended Virginia Tech University and graduated in 2016…as a junior in 2013, was selected to the Blacksburg Regional All-Tournament Team, ACC All-Tournament Team, and All-ACC first team…also earned All-ACC Academic Team honors in 2011 and 2012. Batted .258 with 13 home runs and 27 RBI in 110 games in a season interrupted by two stints on the disabled list…the average was his highest of his three seasons with Oakland as was his .332 on-base percentage and .769 OPS…became the first player in Oakland history to start at least one game at seven different positions (49 in left field, 13 at second base, five in right field, four at third base, three at shortstop, two in center field and one at first base)…hit .289 (39-for-135) with an .835 OPS against left-handed pitchers, .233 (38-for-163) with a .713 OPS against righties…nine of his 13 home runs came with the bases empty…went 9-for-66 (.136) with runners in scoring position, 3-for-32 (.094) with RISP and two outs and 1-for-14 (.071) with a grand slam with the bases loaded…the mark with RISP was third lowest in the AL among players with at least 70 plate appearances with RISP…his career marks are .201 (31-for-154) with RISP, .151 (11-for-73) with RISP and two outs and .053 (1-for-19) with the bases loaded…had 10 home runs and 22 RBI in 65 games before the All-Star Break…then had three home runs and five RBI in 45 games after the break…batted .311 with a .378 on-base percentage when leading off an inning…hit .456 with six doubles, a triple, six home runs and 12 RBI (.912 slugging percentage) when putting the first pitch in play…12 of his 29 career home runs have come on the first pitch…had a .311 average with no outs, a .229 average with one or two outs…batted .325 in interleague play, .248 against the American League…went 2-for-27 (.074) in the ninth inning…committed six errors, including two in 73 games in the outfield, two in three games at shortstop and two in 16 games at third base… went 3-for-19 (.158) with a RBI, three walks and eight strikeouts as a pinch hitter…tied for third among AL pinch hitters in strikeouts and tied for fourth in plate appearances (22)…is now 7-for36 (.194) with 14 strikeouts in the pinch in his career…started games in every spot in the batting order except third and fourth…hit eighth 22 times and second 21 times. OAKLAND: Was on the A's Opening Day roster and went 4-for-13 (.308) with a home run and RBI in four games before he was placed on the 10-day disabled list April 7 retroactive to April 6 with a hyperextended left knee…went 2-for-7 (.286) with a run, double, home run, RBI, walk and strikeout on a two-game rehab assignment with Single-A Stockton on April 14 and 15 and was reinstated from the DL April 16…hit .303 (20-for-66) with four home runs and 11 RBI over a 23-game stretch from April 22 to May 26…made his first Major League appearance at third base May 7 against Houston and his first start at that position May 18 at Toronto…hit his first career grand slam May 19 at Toronto…it was his second career four-RBI game (Sept. 9, 2017 vs. Houston, 2nd game)…started a season-high eight consecutive games from May 25-June 1 (four in left field, three at shortstop, one at second base) and went 5-for-28 (.179) over that stretch… hit .194 with one home run and two RBI over a 21-game stretch from May 27 to June 24…then went 16-for-46 (.348) with four home runs and nine RBI over his next 15 games through July 23… had a career-high seven-game hitting streak from July 11 to 23 (10-for-25, .400)…was placed on the 10-day disabled list July 29 retroactive to July 28 with a left elbow laceration…did not have a rehab assignment before he was reinstated from the DL Aug. 7…went 2-for-24 (.083) over his first 11 games following his return but then hit .323 over his final 28 contests beginning Aug. 22… homered Sept. 8 against Texas to snap a career-high 29-game homerless streak…it was his first home run since July 13 at San Francisco…hit three home runs over a 13-game stretch from Sept. 8 to 26…made his professional debut at first base with a start on Sept. 29 at Los Angeles (AL)… has now played every position in his career except pitcher and catcher…batted .286 in 20 games in September…was on the A's Wild Card roster but did not play. The A's rookie utility player batted .238 with 15 home runs and 42 RBI in 87 games…ranked ninth among American League rookies in home runs and RBI and 10th in extra base hits (31)…started 28 games in right field, 18 at shortstop, 13 at second base, seven at designated hitter, four in center field and two in left field to become the first rookie in Oakland history to start at least one game at six different positions…the last A's rookie to start a game at five positions prior to him was Luis Quinones in 1983…is one of two Athletics over the last 22 years to start at least one game at six different positions (Adam Rosales in 2010)…entered the season with no professional experience in the outfield…had 92 strikeouts and 18 walks in 309 plate appearances…based on a minimum of 300 plate appearances, he had the seventh fewest plate appearances per strikeout in Oakland history (3.36) and the 10th highest strikeout-to-walk ratio (5.11)…batted .247 (21- for-85) against left-handed pitching compared to .234 (46-for-197) with 12 of his 15 home runs against right-handers…had 10 of his 18 walks against lefties…hit .221 with 10 of his 15 home runs and 28 of his 42 RBI at home but had a .255 batting average on the road…had 11 home runs and 27 RBI in 37 day games compared to four home runs and 15 RBI in 50 games at night…had a .196 average when leading off an inning, .171 with runners in scoring position and two outs and .144 with two strikes…was 0-for-5 with the bases loaded…committed four errors in 22 games at shortstop (.952 fielding percentage) and one in 16 games at second base (.983)…also made one error in 35 games as a right fielder and had a .987 fielding percentage in 41 games overall in the outfield…batted .275 as an outfielder, .217 as an infielder and .190 as the designated hitter… went 1-for-10 (.100) with five strikeouts as a pinch hitter…started games at every spot in the batting order except leadoff and cleanup…saw his most action with 24 starts batting second. OAKLAND: Began the season at Triple-A Nashville and was batting .324 in nine games when he was promoted to Oakland April 16…went 2-for-11 (.182) over his first six games with the A's but then hit .308 with six home runs and 13 RBI over a 20-game stretch from April 29 to May 31… made his professional debut in the outfield May 7 against Detroit with a start in right field…also stole the first base of his career in that game…had his first career two-homer game May 31 at Cleveland and was a perfect 3-for-3…finished May with a .304 batting average in 18 games but then hit .195 in 21 games in June…started the month with a career-high 0-for-13 streak that he snapped with his eighth inning double June 4 against Washington…started in right field June 15 against New York (AL) and moved to shortstop in the eighth inning…became the third player in Oakland history to play right field and shortstop in the same game…joins Tony Phillips (July 4, 1989 vs. Kansas City) and Bill Almon (six times from 1983-84)…did it again Aug. 21 at Baltimore…was batting .234 with nine home runs and 25 RBI in 47 games with the A's when he was placed on the disabled list June 24 with a strained left hamstring…went 5-for-27 (.185) on an eightgame rehab assignment with Nashville from July 18 to 30 and hit .266 with a home run and two RBI in 17 games overall with the Sounds…was reinstated from the DL July 31 and hit .241 with six home runs and 17 RBI over his final 40 games with the A's…made 28 of his 33 starts following his return in the outfield (24 in right field, four in center field, one in left field)…was 9-for-18 (.500) over his first five games following his return…capped that stretch with his first career four-hit game Aug. 6 at Los Angeles (AL)…then went 7-for-42 (.167) over his next 12 contests before connecting for his second career two-homer game Aug. 26 against Texas…had a career-high four RBI and his third career two-homer game in the second game of the Sept. 9 doubleheader against Houston…then went 7-for-40 (.175) over his final 11 contests…made all four of his starts in center field in consecutive games from Sept. 18-22. Made both his Triple-A and Major League debuts in 2016…hit .256 with 14 home runs and 51 RBI in 107 games with Nashville and .235 with a home run and four RBI in 22 games with Oakland…batted .152 over his first 12 games with the A's, .389 over his final 10 contests…made nine of his 12 starts against left-handed pitchers…hit .286 (8-for-28) with his lone home run against lefties compared to .174 (4-for-23) against righties…had a .182 batting average with the bases empty, .333 with runners on base…went 3-for-7 (.429) with a double and RBI as a pinch hitter…hit .375 with two outs, .171 with zero or one out…batted .188 against a pitcher the first time he saw him in a game, .316 after that…appeared in 13 games (nine starts) at second base and seven games (three starts) at shortstop…committed three errors as a second baseman (.914 fielding percentage) and none in 16 chances as a shortstop…was selected from Nashville Aug. 19 and made his debut with a start at second base the next day at Chicago (AL)…went 0-for-4…singled off Jose Quintana at Chicago (AL) on Aug. 21 for his first big league hit…had a RBI single in the third inning Aug. 23 against Cleveland for his first RBI…went 2-for-3 with a pair of doubles for his first multi-hit game, Sept. 23 against Texas…hit his first home run Sept. 29 at Seattle, a solo shot off Ariel Miranda to lead off the sixth inning…was rated as the A's No. 7 prospect by Baseball America following the season. Was named Texas League Player of the Year and the A's Organizational Hitter of the Year after batting .317 with 15 home runs and 86 RBI in 117 games with Double-A Midland…led the TL in RBI and total bases (232), ranked second in batting and slugging (.486), third in hits (151) and OPS (.847), tied for third in hit by pitches (8), fifth in doubles (32), tied for fifth in extra base hits (49), sixth in on-base percentage (.361), seventh in runs (71) and tied for eighth in home runs… was a TL Midseason and Postseason All-Star…led the A's farm system in batting, ranked second in RBI, third in slugging and total bases, fourth in hits, fifth in home runs, tied for fifth in extra base hits, sixth in doubles and on-base percentage and seventh in runs…hit .352 against left-handed pitching compared to .304 against right-handers…slammed seven of his 15 home runs against lefties and slugged .640 against lefties compared to .432 against righties…batted .361 during the day, .332 after the All-Star Break, .327 with runners in scoring position and .324 on the road… was 7-for-22 (.318) with two home runs and 25 RBI with the bases loaded…had a .371 batting average in June, .336 in July and .333 in August…appeared exclusively at shortstop on defense and led TL shortstops in games (112), total chances (474), putouts (181), assists (267), double plays (61) and errors (26)…had a .945 fielding percentage…saw his most action in the five spot in the order where he batted .348 with 10 home runs and 47 RBI in 65 games…had 42 multiple hit games…went 19-for-45 (.422) with seven multiple hit games over a 10-game stretch from May 17 to 27…was 4-for-5 with a grand slam May 22 at Corpus Christi…it was his first of five four-hit games and his first of two grand slams (Aug. 5 against Frisco)…compiled a 13-game hitting streak from May 30 to June 24…hit .397 with a home run and 15 RBI during the streak…had an 18-game hitting streak from July 6 to 25, which tied for the longest hitting streak in the TL in 2015…went 30-for-73 (.411) with three home runs and 19 RBI during the streak…went 0-for-5 July 26 against San Antonio and then hit safely in 16 consecutive games from July 27 to Aug. 13…hit .338 during the second streak and batted .362 with 36 RBI while hitting safely in 34 of 35 games from July 6 to Aug. 13…had a 21-game road hitting streak from July 8 to Aug. 21, which was the longest in the TL (33-for-97, .340)…went 4-for-5 with a home run and a season-high five RBI July 25 against San Antonio…hit two home runs Aug. 4 against Frisco and homered in three consecutive games from Aug. 4-6…went 7-for-13 (.538) with a double, four home runs and 11 RBI over that span, which included a season-high tying five RBI Aug. 6 at Corpus Christi…went 2-for-13 (.154) with a double and RBI in three postseason games with the RockHounds before going on the disabled list Sept. 12 with a strained left hamstring…missed the remainder of the playoffs…played for Mesa in the Arizona Fall League following the season and hit .235 with four home runs and nine RBI in 13 games…tied for fourth in the AFL in home runs…had two home runs and four RBI in his first game Oct. 13 at Glendale…played in the AFL Fall Stars Game and was named to the AFL Top Prospects Team at second base…was rated as the A's seventh best prospect by Baseball America following the season. Spent his first full professional season at Single-A Stockton and hit .288 with 13 home runs and 55 RBI in 94 games…tied for eighth in the California League in doubles (32)…ranked fourth in the A's farm system in doubles, fifth in slugging (.489), tied for fifth in triples (5), sixth in batting, seventh in extra base hits (50) and eighth in total bases (197)…batted .307 against left-handed pitching compared to .283 against right-handers…hit .335 with a .580 slugging percentage at home…belted 11 of his 47 home runs in the first half…had 21 RBI over his first 23 games through April 29 and 20 over his final 17 games starting Aug. 13…appeared in 76 games at second base, 14 at shortstop and three at third base…committed 14 errors as a second baseman for a .960 fielding percentage…also made one error each at shortstop and third base…batted .308 as a second baseman, .205 at all other positions…had a season-high 10-game hitting streak from April 6 to 15 (18-for-42, .429)…homered in three consecutive games from April 10-12 (four home runs total), giving him five home runs over his first nine games…went 4-for-4 with two home runs and three RBI April 12 against Visalia…had three straight three-hit games from April 29 to May 1 (9-for-13, .692)…hit .324 with seven of his 13 home runs and 21 of his 55 RBI in 24 games in April…was batting .298 with 11 home runs and 30 RBI in 55 games when he was placed on the disabled list July 1 with a sprained right ankle…was reinstated July 14 and hit .273 with two home runs and 25 RBI in 39 games following his return…hit safely and drove in a run in six consecutive games from Aug. 13 to 18…went 13-for-29 (.448) with five doubles, a home run, 12 RBI and four multiple hit games over that stretch…went 2-for-8 (.250) with a RBI in two postseason games. Made his professional debut with Vermont of the Short-Season New York/Penn League and batted .200 with three home runs and eight RBI in 42 games…hit .214 against left-handed pitching compared to .196 against right-handers…batted .364 in the ninth inning…committed eight errors in 33 games at shortstop for a .944 fielding percentage…also made one error in two games as a third baseman…went 0-for-4 in his professional debut June 19 at Tri-City…then homered the next day against Connecticut for his first professional hit…was batting .167 with two home runs and four RBI in 18 games when he was placed on the disabled list July 23 with a strained left oblique…was reinstated Aug. 9 and hit .225 with a home run and four RBI in 24 games following his return. 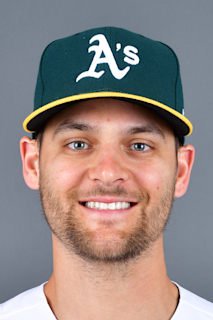 August 7, 2018 Oakland Athletics activated LF Chad Pinder from the 10-day injured list. July 29, 2018 Oakland Athletics placed LF Chad Pinder on the 10-day disabled list retroactive to July 28, 2018. Left elbow laceration. April 16, 2018 Oakland Athletics activated LF Chad Pinder from the 10-day disabled list. April 14, 2018 Oakland Athletics sent SS Chad Pinder on a rehab assignment to Stockton Ports. April 7, 2018 Oakland Athletics placed SS Chad Pinder on the 10-day disabled list. Hyperextended left knee. July 31, 2017 Oakland Athletics activated SS Chad Pinder from the 10-day disabled list. July 18, 2017 Oakland Athletics sent 2B Chad Pinder on a rehab assignment to Nashville Sounds. June 24, 2017 Oakland Athletics placed 2B Chad Pinder on the 10-day disabled list. Left hamstring strain. April 16, 2017 Oakland Athletics recalled 2B Chad Pinder from Nashville Sounds. March 17, 2017 Oakland Athletics optioned 2B Chad Pinder to Nashville Sounds. August 17, 2016 Oakland Athletics selected the contract of Chad Pinder from Nashville Sounds. April 5, 2016 SS Chad Pinder assigned to Nashville Sounds from Midland RockHounds. February 10, 2016 Oakland Athletics invited non-roster SS Chad Pinder to spring training. September 24, 2015 Midland RockHounds activated SS Chad Pinder from the 7-day disabled list. September 12, 2015 Midland RockHounds placed SS Chad Pinder on the 7-day disabled list. September 7, 2015 Midland RockHounds activated SS Chad Pinder from the temporarily inactive list. September 5, 2015 Midland RockHounds placed SS Chad Pinder on the temporarily inactive list. April 7, 2015 SS Chad Pinder assigned to Midland RockHounds from Stockton Ports. March 9, 2015 IF Chad Pinder assigned to Oakland Athletics. July 14, 2014 Stockton Ports activated 2B Chad Pinder from the 7-day disabled list. July 3, 2014 Stockton Ports placed SS Chad Pinder on the 7-day disabled list retroactive to July 1, 2014. March 31, 2014 SS Chad Pinder assigned to Stockton Ports from Vermont Lake Monsters. June 16, 2013 SS Chad Pinder assigned to Vermont Lake Monsters. June 14, 2013 Oakland Athletics signed 3B Chad Pinder.